Orchestras (and audiences) get more Asian-American every year. Will it be enough? 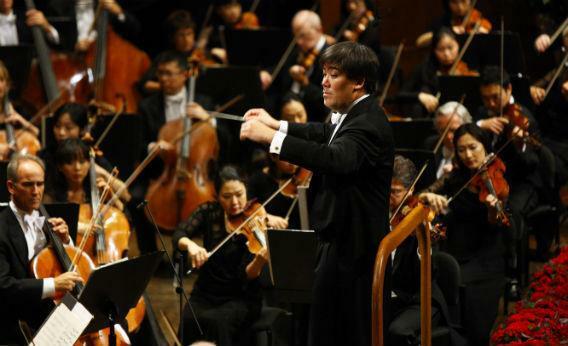 Alan Gilbert, son of Japanese and American violinists, conducts the New York Philharmonic. What do symphony orchestras and cigarette companies have in common? It’s the age problem. How do you stay in business when your customers keep dying? For orchestras, at least it’s not their product that’s lethal, though it might as well be. With the median age of concertgoers rising, fewer than one in 10 adults reported attending a classical concert in 2008, according to a periodic survey conducted by the National Endowment for the Arts, a 28 percent drop since 1982. The financial state of orchestras today is roughly comparable to that of Blockbuster Video post-Netflix. Ticket sales are dropping; layoffs and bankruptcies abound. In the past two years, the Honolulu, Syracuse, and New Mexico orchestras closed up shop entirely; the Philadelphia Orchestra, long revered as one of the five best in the country, filed for Chapter 11 protection in April. But there is one group that still likes classical music and, what’s more, pays to hear it performed: Asians. Of Asian-Americans ages 18-24 responding to the same survey, 14 percent reported attending a classical concert in the past year, more than any other demographic in that age group. Despite classical’s deserved reputation as the whitest of genres, Asian attendance rates match or surpass the national average up through the 45- 54 age range. To put it one way, the younger the classical audience gets, the more Asian it becomes. To put it another, the only population that is disproportionately filling seats being vacated by old people dying off is Asians. This reflects what can be observed at most American concert halls today: a sea of white hair, broken only by the black, unflattering bowl cut given to all Asian kids by their parents, who have dragged them to the symphony for their cultural enrichment. I know because I was one of those kids. I’m a hapa (mixed-race) Korean-American, with an American father and Korean mother. At age 5, I was given a quarter-size violin. Private lessons followed, with regular trips to the Kennedy Center to see the National Symphony Orchestra. By 12, I was concertmaster of my school orchestra and performing solo recitals. For a time, it was fun. At no point did I feel I had much of a choice in the matter. “There was a time when practically every major soloist was Jewish,” says violinist Joshua Bell. “Every Jewish kid grew up wanting to play the violin. Now it’s true among Asians.” (Or at least among Asian parents.) This shift became apparent within conservatories and orchestras in the 1970s, when the ranks of Eastern European and Jewish musicians, who had long dominated the field, began to decline, while those of Asians started to swell. Asians make up just over 4 percent of the U.S. population, but 7 percent of U.S. orchestra musicians are Asian, and the figure rises to 20 percent for top orchestras such as the New York Philharmonic. At the elite Julliard School for music, one in five undergraduates—and one in three Ph.D. students—is Asian. A word of caution: “Asian” in the American context encompasses a broad geography spanning Pakistan to Indonesia and including everyone ranging from fresh-off-the-boat immigrants to third-generation Asian-Americans and adoptees. In reality, the Asian classical phenomenon does not extend much beyond China, Japan, and Korea. Yet for East Asians at least, classical music is a genuine common thread, albeit a relatively young one. Its presence in the region goes back little more than a century, to the military bands brought to Japan by Commodore Perry’s opening. The early association of Western music with military discipline and modernization set a precedent. Classical music became an aspirational totem for both newly industrializing Asian countries, whose governments subsidized music schools and orchestras, and parents, for whom having a musician in the family was marker of success. But not just any musician. Asian and Asian-American performers gravitate almost exclusively to strings and piano: Those instruments which, within a genre that symbolizes class mobility in Asia, are at the top of the heap. Rarely does one encounter an Asian conservatory student playing the bassoon or trombone, or any instrument that does not afford the possibility of soloist superstardom. The prestige Asians ascribe to classical music is, it should be noted, completely disproportionate to the actual salaries earned by professional musicians. And the Asian juggernaut has yet to move much beyond the orchestra pit. One area in which Asians do not dominate, Yoshihara notes, is orchestra management, which remains overwhelmingly white. The boards of most performing arts organizations are made up of wealthy corporate donors, who tend to recruit managers and other board members from within their own social circles. And in contrast to celebrity musicians like Yo-Yo Ma and Lang Lang, Asians haven’t made much headway into conducting or composing. Asian music education is not famous for its music theory. The Suzuki method, Asia’s most successful classical music export, is a highly mechanical training regimen based on drills and rote memorization, with no emphasis on “feeling” the music. It lends itself best to the equally mechanical works of the Baroque period, less to the Romantic era and not at all to contemporary classical. However circumscribed the music may be, Asia is one place where classical artists can be genuine pop stars in ways long forgotten in Europe and North America. “Whenever I play in Korea, I feel like I’m at a rock concert,” says Bell. If there’s any irony to the most quintessentially Western music tradition being kept alive by the East, by now it’s a moot point. Classical music is as Asian as tempura and Spam. Even if it eventually dies in the West, it will have an Asian afterlife, much in the way washed-up American rock bands can still pack stadiums in Manila. Classical music probably won’t ever disappear completely from our shores. If it survives, it will be thanks in large part to continued Asian immigration and an audience that is increasingly imported. Faced with the unenviable task of trying to make the most hidebound of music traditions hip and relevant to kids, the survival strategy of orchestras has mostly been to throw up their hands and pray that their remaining season ticket-holders cling to life another year. Instead, they might prepare for a future in which their subscribers look a lot different than they do today, and cultivate leadership, outreach and programming which reflect that. As for me, I eventually grew tired of the violin and stopped playing. But I never lost my love for Mozart and Mahler. It’s said that playing an instrument as a child is the greatest predictor of concert attendance as an adult. So I still go to those same concert halls I went to as a kid. Only now, I no longer have the bowl cut, and I attend by choice.